It's summer! That means it's time to break out the flip-flops and head to the beach. Or lake. Or campsite. Or wherever you enjoy relaxing during this hot time of the year. Many coin collectors spend the summer cruising the bourse of major coin shows such as the Florida United Numismatists annual summer convention or American Numismatic Association World's Fair of Money, which are usually held in July and August, respectively. S-Mint Proof Coins – Proof coins from the San Francisco Mint have been popular with coin collectors for decades. They seem to represent a particularly strong area of interest as S-mint proof coinage, which began in 1968, is gearing up for its 50th anniversary. Modern proof coins offer numerous exciting opportunities for coin collectors of virtually any budget, and many proof sets made since 1968 can be bought for less than $10 each. Kennedy Half Dollars – Can you believe it? One of our nation's most vibrantly youthful presidents and an icon of the early 1960s would have turned 100 years old in 2017. Of course, I'm talking about John F. Kennedy, who served as president of the United States from 1961 until his assassination at the age of 46 in 1963. Within months of his tragic killing by an assassin named Lee Harvey Oswald, Kennedy's bust appeared on the obverse ("head's side") of the half dollar, and since 1964 his likeness has remained a fixture on the 50-cent piece. Interest in the Kennedy half dollar has risen during the centennial of Kennedy's birth and is certain to carry through beyond 2017 as more collectors embrace this time-honored, beloved half dollar series. Saint-Gaudens $20 Gold Double Eagle – Saint-Gaudens double eagle $20 gold coins have long been considered one of the world's most beautiful coins. Collectors who have the financial means to buy these beautiful pre-1933 gold coins prize them, and they often form the foundation of type sets. As gold bullion prices hover at some of the most affordable levels in years, more coin collectors are taking the opportunity to buy Saint-Gaudens gold coins while prices are relatively low. If you've always wanted to add a Saint-Gaudens $20 to your coin collection, now may be the time to act. United States Mint 225th Anniversary High-Relief Gold Coin – The year 2017 marks the 225th anniversary of the United States Mint, founded in Philadelphia – then the nation's capital. To celebrate this momentous occasion, the U.S. Mint has released a special high-relief gold coin that has drawn much attention. 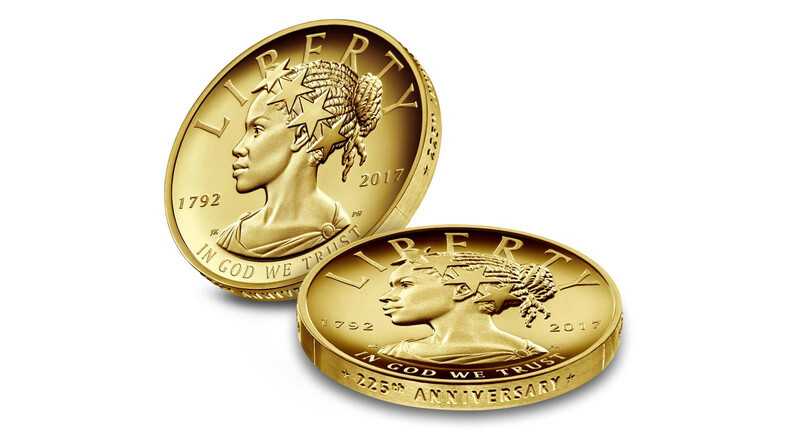 The 2017 American Liberty 225th Anniversary Gold Coin contains 1-ounce of .9999-fine gold and features the head of Miss Liberty as portrayed by an African American figure. It's the first time Miss Liberty has been depicted as such on an official United States, and this $100 denomination gold coin is certain to remain a landmark piece in U.S. coinage history for years to come.